I am incredibly excited to share with you that myself and a wonderful production team have secured funding from Arts Council England to turn my record Lullabies For Parents into a theatre show. we are working with a small number of theatres to bring the show to life and there will be much more info when it is all confirmed. 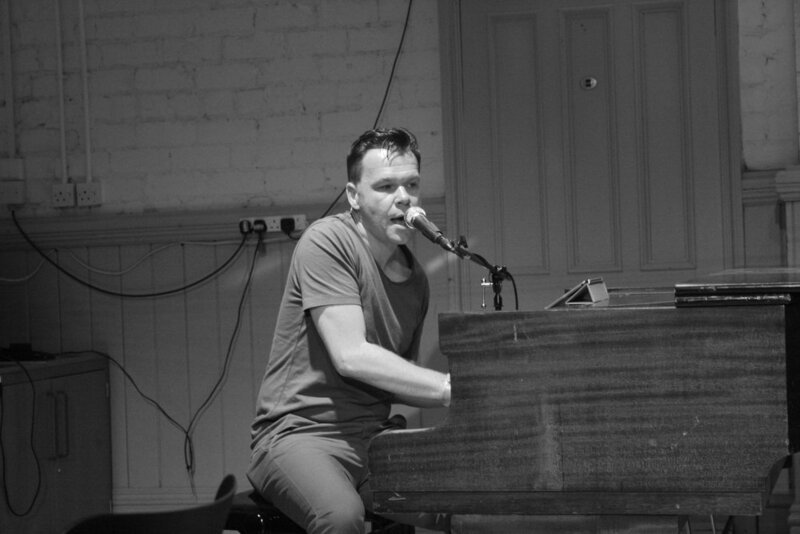 Monochrome is a monthly piano night curated by musician Ric Neale at The Jolly Tap in Wakefield. At each show Ric will do a support slot and then a featured artist will do a set on the piano in the bar. They show starts at 8pm and it's Pay What You Want. It's here!!! LULLABIES FOR PARENTS has finally arrived. Im incredibly proud of this new record and you can link to all of the ways to listen to it HERE. Come celebrate it's release at The Jolly Tap in Wakefield on Monday July 9th. Dancing Bear - show trailer from Jamie Fletcher on Vimeo. Really excited to announce that I'm going on a little solo tour in November, three shows in Wakefield, London and Leeds. All the shows are on real pianos in lovely venues so get along to any or all of them if you can! Huge thanks to everyone that came and supported Rob Reed and I at the debut of our new theatre show NEVER WORN as part of Wakefield Literature Festival. We had an awesome time and are hopeful that we'll get chance to do the show again in the not too distant future. Had a really great night doing RIC NEALE DOES PET SOUNDS (and other stuff) at Headingley Heart last night. Massive thanks to those that came down. Particular thanks go to the staff at Heart who were so welcoming and to Mel Neale for taking these lovely photos. Huge apologies to the people that were hoping to come to the shows I've had to cancel due to illness. By all accounts they all went fine despite/because of my absence. I've now rescheduled the gig at Dulcimer for July 6th so check out the events page for more details. There are a few more gigs up there now so hopefully I'll see you at one of them soon. RIC NEALE DOES PET SOUNDS is out now! I play all the songs from the classic Beach Boys album with just a piano and my voice. it was a really tough challenge and I'm very pleased to share it with you. You can listen to it HERE. Also you can watch a DOCUMENTARY made by Sean Macreavy about the process of making the record. As well as that there are quite a few new shows scheduled so check out the EVENTS PAGE to find out more. All kinds of things have been happening over the early part of 2017 which I haven't had chance to share with you. Firstly, there are a few new gigs up on the events page and more are being added as time passes. Keep an eye on it and stuff will be coming your way. My RIC NEALE DOES PET SOUNDS record is now finished and should be out at soon. I'm super happy with it and cant wait to share it with all of you. You can watch a clip of me playing one of the songs from it on the Videos page. I've also been out to do a couple of shows in South Korea which was an amazing experience. ...surely you'll be sick of me by then...? I've been asked to contribute a track to the debut "60 second recordings" album "I Found Myself Mirrored in Autumn". It's an album featuring ten artists, each of which have created a track that is one minute in length. My track "Give Me A Minute" features my friend Robbie Tabrett on bass and will be a bit of a sonic surprise to the people that usually hear me with just a piano, but i had a great time producing it. It's going to be out on November 11th and you can read more here. Many Thanks to all that came down to the Pet Sounds show in Chorlton, Manchester, I had a wonderful time and it looks very likely that I'll be doing it again soon. In other news I'll be returning to Unity Works in Wakefield to play some of my new material. The show is on Wednesday November 23rd and will feature support from Rob Reed. I had a great time playing at the Underneath The Stars festival. Huge thanks to all the folks that came to see my set; saw some old friends and made some new ones. In exciting news I have made a new record. I know it's only a few months since the last one but i had an opportunity to use some studio time so had an intensive period of writing and came up with four new songs. Originally they were going to be demos for a bigger project but i was so happy with the quality of the recordings that i thought id share it with folk. it's live on my bandcamp page now and will be on itunes and spotify over the next few weeks. "Pencil" as it is called, was recorded and mixed by the fabulously talented Mark Pavey over two days in Wales at the start of July. A massive thanks to him for all of the hard work he put into the project. It looks likely thatI'll be playing piano on his forthcoming record at the end of the year so watch this space. You can stream all of Pencil (and purchase it i might add) below. The Pet Sounds 50th anniversary show at Oporto was a huge success so massive thanks to everyone that came down (and it was packed). I've been invited back to do a set of my own material (which is quite a lot easier to sing) on Monday July 11th so check out the events page for more info. Ric Neale Does Pet Sounds from Ric neale on Vimeo. The very next day Ric and his band The Housekeping Society played two sets at the prestigious Internatioonal Pop Overthrow festival at The Cavern in Liverpool. again, a great many thanks to those of you that came along to support us, we had a great day. On monday May 16th Im doing all of the songs from The Beach Boys album PET SOUNDS at Oporto in Leeds to celebrate the 50th anniversary of it's release. come on down, it'll be really good fun - hopefully it'll feel like a birthday party! Ric Neale - Gratitude (Live) from Ric neale on Vimeo. It's here! "All That Counts" is OUT NOW. You can listen to it and purchase it below, and if you want to listen to the bonus record "Counting Backwards" go to the music page. Also, don't forget that Ric will be launching All That Counts at Unity Works in Wakefield on Wednesday April 13th. There are a few more gigs coming up, go to the events page to find out more. Here's a video of Ric playing the song "Dotted Line" fro Joe Simpson's "Almost There" project. Ric Neale - Dotted Line from Ric neale on Vimeo. Here's a little video that Ric made of his new song "Together" from the forthcoming record "All That Counts"
Ric Neale - Together from Ric neale on Vimeo. Ric is playing at The Hepworth Gallery in Wakefield on April 21st to celebrate the work of artist Martin Parr. He's even writing a new song just for the occasion. It is free and a lovely place to hang out. The theatre piece that Ric wrote songs for and musically directed "Dancing Bear" was performed to a sell out crowd at The West Yorkshire Playhouse in Leeds and The Contact Theatre in Manchester last week and was a huge success. As well as receiving a standing ovation the show also got a five star review in the West Yorkshire Post (it also described the songs as "Achingly beautiful"). The show, in which Ric plays, acts and even dances is hopefully going on tour in early 2017. Welcome to the all new Ric Neale website. As we approach the release of the new album "All That Counts", this is where you will be able to find out about everything that's going on. It's all very exciting.